Whenever I’m asked to speak to a group -- whether it’s a large gathering like a college commencement, or a smaller one like those found at a local chamber of commerce’s monthly breakfast -- I think of Steve Jobs, the master presenter. The co-founder of Apple didn’t just focus on statistics or technology in his communications; he sold the benefits of his company’s products. Take a quick look at Jobs’ keynote address introducing the iPhone during the 2007 Macworld Conference & Expo. Visuals were used to illustrate a point, not to fill space or entertain. And no matter how brief or long the Jobs-led dog-and-pony show, you left the venue with a full understanding of what was presented. We can all take some communications cues from Steve Jobs. Here are five that I recently came across from Jim Confalone, co-founder and creative director of ProPoint Graphics, a New York-based professional presentation design firm. 1. Know the one critical point in your presentation -- then make it clear. Steve Jobs recognized that the human mind couldn’t process a mountain of material in one sitting. Any information or data that isn’t driving a specific message can be a distraction that weakens the impact of your presentation. Use only visuals that support your one point. 2. Acknowledge why people are listening to you. Your audience is in the room for a particular reason. It’s critical to understand why they’re listening to you so you can tune your presentation in a manner that makes them more receptive listeners. The same talk might play out very differently if it’s given to shareholders, engineers or sales people. 3. Make an immediate, personal connection. 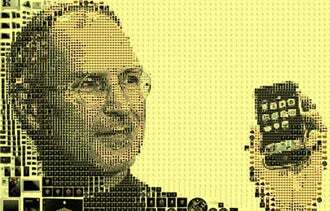 Jobs always began by trying to make an emotional connection with the audience, even though his goal was to sell technology. This connection builds empathy, which in turn encourages your audience to be more receptive to what you have to say. 4. Keep the audience focused on you the speaker, not your presentation. The audience isn’t there to look at your slides. They’re there to see and listen to the presenter. Keep their focus on you. That may mean bringing a prop to hold up and draw their attention to, or it may mean inserting a blank slide into your presentation so that the audience is forced to look at you. Steve Jobs often did this — again, drawing the audience’s attention to himself. 5. Know your story. You should know your content so completely that you are comfortable giving your presentation with no visuals at all. Steve Jobs was notoriously meticulous about his preparation, scripting everything. Other presenters prefer to have an element of spontaneity or improvisation. Regardless of your style, mastery of your story affords you the luxury of calm and clarity, essential components to a great presentation. What's your best presentation tip? Share your and read others in the comments below.